* Audio effects include, amplify, normalize, equalizer, envelope, reverb, echo, reverse, sample rate conversion and more. 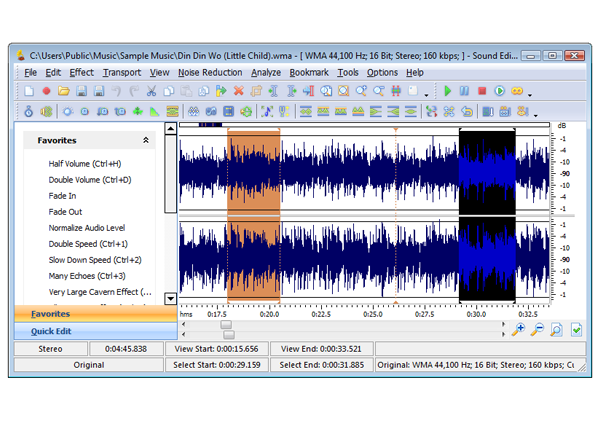 * Full featured Mp3 editing software support. * Supports a number of other file formats including wav (multiple codecs) vox, gsm, au, aif, ogg, wmv and many more. * Recorder supports autotimer and voice activated recording and more. * Supports for bookmarks and region markers. Regions can be saved as separate files. Qweas is providing links to Sound Editor Pro 6.1.2 as a courtesy, and makes no representations regarding Sound Editor Pro or any other applications or any information related thereto. Any questions, complaints or claims regarding this application Sound Editor Pro 6.1.2 must be directed to the appropriate software vendor. You may click the publisher link of Sound Editor Pro on the top of this page to get more details about the vendor.